The first step is to decide which boiler is best for you: combi (short for combination) or system? Combi boilers – Britain’s best-selling type of boiler, as they are compact and quick to install – provide heat for your radiators and hot running water on demand. They don’t need a water storage cylinder and so take up less space, making them ideal for smaller properties. For larger households, however, system boilers will be the answer, or for those seeking the convenience of being able to run hot water from more than one tap at a time. To ensure you have enough hot water for your family from a standard single-coil cylinder, the rule of thumb is to allow 25 litres per person per day. We do, however, recommend that all new installations have a twin-coil cylinder instead, to futureproof the home for the potential retrofitting of a solar thermal or renewable heating system. It’s also worth considering upgrading from a gravity-fed system (where pressure is generated from a cold water tank, often placed in the loft) to a four-pipe system. While most boilers in the UK have two pipes, which provide hot water and heating concurrently, Worcester and Vaillant set-up uses four pipes to deliver hot water separately to both heating and hot water circuits. In doing so, the boiler prioritieses hot water to ensure its immediate availability and heating water temperature is reduced so the boiler fully condenses most of the time. As a result, a lower output, more affordable boiler can be installed that uses less energy. Combis work as sealed systems, providing hot water for both the taps and central heating system, heating the water directly from the mains as and when it is needed — meaning there is no need for a hot water storage cylinder, or a cistern in the roof space. Advantages: Combis are quicker, easier and cheaper to fit than system boilers, as well as space saving due to the lack of a cylinder or cistern. Water is delivered at mains pressure, so you can enjoy a more powerful (although not ‘power’) shower. Disadvantages: It’s a priority system, so it only satisfactorily deals with one heating need at a time. While fine for small families with one bathroom, larger families will experience poor flow rates when multiple outlets are used at once. Performance is also dependant on the diameter of the pipe entering the property: if it’s less than 22mm, then a combi is a bad choice. System boilers are fitted to sealed heating systems, but unlike combis work on the principle of storing hot water in a cylinder, so they can feed several outlets at once at mains pressure. There’s no need for a cistern in the loft and the expansion vessel is built in. Advantages: Ideal for larger homes with higher demands, and as they have most of their major components built in (i.e. expansion vessel and pump), installation is quicker, cheaper and neater. Flow rates are usually high as water is delivered at mains pressure, and hot water is instantaneous. Disadvantages: Will run out of hot water if overused. Some installers claim they are more complex and prone to problems than regular boilers, such as pressure loss. Regular boilers are now largely bought as replacements for homes with an open-vented heating system (i.e. supplied by means of a feed and expansion cistern in the roof space, meaning the system is open to air). Like system boilers, they work on the principle of stored water and require a separate hot water cylinder. Advantages: The water out of the taps will be at a good flow rate (not to be confused with pressure) and hot water can be supplied instantaneously. This is the ideal setup for a ‘power’ shower, which requires a cold water feed from the cistern and a separate electric pump. Disadvantages: They’re more expensive to install, needing more components and pipework, and also take up more space. They can suffer from low pressure if the cistern is not located high enough, meaning additional shower boosters may be required. Hot water can run out. Note: Sealed or Open? In a sealed circuit, the system is filled to approx 1 bar pressure and then sealed. Unlike an open-vented system, there is no cistern, so an expansion vessel handles excess water. Sealed systems are more efficient. Improvements to boilers have been matched by advances in their controls. Rather than the traditional single thermostat in the hallway, intelligent zoning controls enable different temperatures and timing programmes to be set around the house, avoiding heating empty rooms. You can also remotely control and monitor energy usage using a smartphone app. Weather compensation controls can boost the efficiency of a condensing boiler by as much as 15 per cent. Thanks to a small sensor on the exterior of the building, the boiler increases or decreases the radiator temperature to compensate for outdoor temperature changes. These small adjustments consistently maintain the room at your chosen temperature, regardless of a temperature drop or rise outside. There is a common misconception that weather compensation controls can’t be fitted on old properties in order to boost the boiler’s efficiency. Actually they can, as long as the installer has correctly set the boiler’s operating gradient. This is largely determined by how well the property is insulated. We take our time choosing a new car, considering which will be most economical to run or comfortable. We live with our boiler for much longer — so it pays to invest the same efforts in your heating system. It was once common practice to oversize boilers by around 30%, but nowadays this is considered wasteful, making it important to specify the right size for your home. This is decided by means of a heat loss calculation and will be affected by the house’s size, the materials used and the level of insulation and airtightness, as well as your hot water requirements, i.e. how many bathrooms are there? 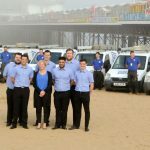 A heating engineer can work this out for you, but you can also use a free online calculator — try the one at sedbuk.com. Once you know the heating requirements of each room in kilowatts, you can size your heating emitters – i.e. radiators or underfloor heating – then you will know the boiler you buy will be big enough to heat the whole system efficiently. 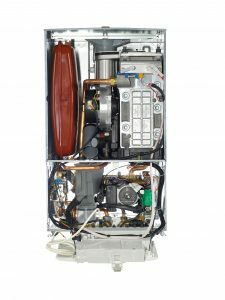 Before the advent of the condensing boiler, the heat contained within the combustion products that were discharged from the boiler – which could be anything up to around 180°C – were simply wasted. Condensing boilers were designed with the purpose of extracting as much of the heat energy in the fuel as possible, and turning it into useable heat to warm the house. This means they burn less fuel for the same amount of heating. ?Since 2005, condensing boilers have been made compulsory by the Building Regulations for new domestic central heating boilers. Boilers are ideally positioned on the ground floor in houses (a requirement for oil-fired boilers), within the kitchen or a utility area. Careful consideration must be given to the position of the flue as condensing boilers produce a plume of steam which can be a nuisance. See the Building Regulations Part J for detailed advice and diagrams. A well-sized solar water heating system could provide up to 60% of your annual hot water requirements, but careful thought needs to be given to how the central heating system will work as a whole. Firstly, you must buy a compatible boiler — not many combi boilers work with solar, but most regular and system boilers will be fine. Secondly, you will require a twin-coil cylinder, which will be heated via heat exchangers from both the boiler and the solar system. If hot enough, the volume of stored water can be fed directly to the tap (i.e. 60°C plus). If the water is not up to temperature, the boiler compensates, using less fuel overall. Ground-source heat pumps are often designed to be the sole source of heating and hot water in the home, but many models can be configured to take a supplementary heat source such as an oil or gas-fired boiler. It’s important to buy the most efficient boiler you can, close to 90% (check sedbuk.com), in an appropriate size. Aim for at least a five-year warranty. The boilers that work to the highest standard are the fan-assisted room-sealed type — i.e. it takes air from outside the building and combustion products are forced out using a fan. A-rated gas and oil-fired boilers are now close to, or over, 90% efficient, so there is not a great deal of room for improvement. To increase overall efficiency we have to look beyond the boiler. Typically boilers run at a single flow temperature, which will be right for either the central heating or the hot water, but not both. Add a heat pump or solar thermal panels and the temperature mix gets even more complicated. This can mean mixing cold water to get the desired temperature, which is wasting a lot of heat. A more sensible option is to install a thermal store which will store water at a different temperatures from the top to the bottom of the tank. This can allow the boiler to run at its optimum efficiency and deliver water to the central heating or tap at the right temperature. Central heating controls are obviously essential. The ubiquitous room thermostat with a timer is the bare minimum, improved with radiator thermostats or, even better, zone controls. These allow time and temperature control for each zone or room, ensuring that rooms that are not occupied are not heated at the same time or to the same temperature. A good boiler needs a good heating distributions system. An old central heating system can get furred up and sludge collects in the bottom of radiators. A new boiler will be more efficient, but cleaning the system and adding anti-furring liquid will only help. It is difficult to predict a time when gas and oil-fired boilers will disappear, and equally as difficult to predict that they will get much closer to 100% efficiency. It would also be brave to predict that oil and gas prices will go against history and start falling. Minimising fuel consumption in the first instance is the key priority. An A-rated boiler is a start, but it is only a start. It is becoming increasingly difficult to believe that a single boiler using a single fossil fuel energy source is a long-term, sustainable option. Renewable energy is also having an impact on the housing market, particularly among self builders and renovators. The heating industry have recognised that there are advantages to bivalent systems and have developed control systems that enable two heat sources to operate in happy unison.